The data were received in one netcdf file per station and contained data from primary and secondary sensors, with various filtered versions. Most of the uncalibrated filtered data (excluding fluor_filt) were not loaded as they had been superseded by calibrated data. The transmittance and optical backscatter channels were not loaded as these were problematic (see cruise report p.17). The originator derived channels were also not loaded, with potential temperature and sigma-theta re-derived by BODC. In addition, press_filt was not required as press_filt_bin_average was a more appropriate pressure variable to use. The remaining data channels were converted into the internal BODC format. The reformatted data were visualised using the in-house EDSERPLO software. The data were screened and quality control flags were applied to data as necessary. The conductivity primary sensor 1 was found to have malfunctioned for three of the casts, 27, 38 and 39. This lead to pronounced salinity and density inversions of >0.5 in these profiles. The conductivity from the secondary sensor 2 appeared to be unaffected, whilst sensor 1 and sensor 2 data compared well for the other casts. Therefore, for casts 27, 38 and 39 only sensor 2 data (all variables) have been included and all BODC derived channels have been calculated using sensor 2 data only. The remaining 92 casts have data from the primary sensors only and all derived channels have been calculated from these. pad_variable - Empty - - Not loaded. press_filt dbar Pressure exerted by the water column (bin midpoint). - - Not loaded. pressure_temp °C Internal temperature measured from CTD pressure sensor. - - Not loaded. scan number CTD record number. - - Not loaded. flag number Flag channel. - - Not loaded as originator did not use. time seconds Time from switching on CTD. - - Not loaded, time taken from header. cond1_filt mS cm-1 Conductivity from sensor 1, processed, cleaned but uncalibrated. - - Not loaded. cond2_filt mS cm-1 Conductivity from sensor 2, processed, cleaned but uncalibrated. - - Not loaded. temp1_filt °C Temperature from sensor 1, processed, cleaned but uncalibrated. - - Not loaded. temp2_filt °C Temperature from sensor 2, processed, cleaned but uncalibrated. - - Not loaded. oxygen_filt µmol kg-1 Dissolved oxygen concentration, processed, cleaned but uncalibrated. - - Not loaded. transmittance_filt Percent Transmittance, processed, cleaned but uncalibrated. - - Not loaded. backscatter_filt - Optical backscatter. - - Not loaded. temp1_cal °C Temperature from sensor 1, processed, cleaned and calibrated from SBE35 data. TEMPCC01 °C All casts except for 27, 38 and 39. Calibrated against reference thermometer SeaBird SBE35. temp2_cal °C Temperature from sensor 2, processed, cleaned and calibrated from SBE35 data. TEMPCC02 °C For casts 27, 38 and 39 only. Calibrated against reference thermometer SeaBird SBE35. cond1_cal mS cm-1 Conductivity from sensor 1, processed, cleaned and calibrated from bottle samples. CNCLCCI1 S m-1 All casts except for 27, 38 and 39. Converted to siemens per metre by dividing the original by 10.
cond2_cal mS cm-1 Conductivity from sensor 2, processed, cleaned and calibrated from bottle samples. CNCLCCI2 S m-1 For casts 27, 38 and 39 only. Converted to siemens per metre by dividing the original by 10.
oxygen_cal µmol kg-1 Dissolved oxygen concentration, processed, cleaned and calibrated from bottle samples. DOXYCZ01 µmol l-1 Converted to micromoles per litre by multiplying the original value by 44.66.
depth m - - - Not loaded. psal_cal pss-78 Practical salinity calculated from calibrated conductivity and temperature data from sensors 1, using the equation of state from UNESCO (1978). PSALCU01 Dimensionless All casts except for 27, 38 and 39.
psal2_cal pss-78 Practical salinity calculated from calibrated conductivity and temperature data from sensors 2, using the equation of state from UNESCO (1978). PSALCU02 Dimensionless For casts 27, 38 and 39 only. potemp_cal °C Potential temperature calculated from calibrated data from primary sensors. - - Not loaded. potemp2_cal °C Potential temperature calculated from calibrated data from secondary sensors. - - Not loaded. sigma0_cal kg m-3 Potential density computed at the surface. - - Not loaded. sigma2_cal kg m-3 Potential density computed at 2000 dbar. - - Not loaded. sigma4_cal kg m-3 Potential density computed at 4000 dbar. - - Not loaded. - - Sigma-theta. SIGTPR01 kg m-3 Generated by BODC using the Fofonoff and Millard (1983) algorithm. - - Potential temperature. POTMCV01 °C Generated by BODC using the Fofonoff and Millard (1983) algorithm. - - Oxygen saturation. OXYSZZ01 Percent Generated by BODC using the Benson and Krause (1984) algorithm. Benson, B.B. and Krause, D., 1984. The concentration and isotopic fractionation of oxygen dissolved in freshwater and seawater in equilibrium with the atmosphere. Limnology and oceanography, No.29(3), 620-632pp. Fofonoff, N.P. and Millard, R.C., 1983. Algorithms for computations of fundamental properties of seawater. UNESCO Technical Papers in Marine Science, No.44, 53pp. UNESCO, 1978. Eighth report of the joint panel on oceanographic tables and standards. UNESCO Technical Papers in Marine Science, No.28, 35pp. Ninety six CTD profiles were performed during the cruise, 95 were received (cast 5 abandoned as pumped blocked, cast 6 at same location). CTD casts are labelled from 1 to 98. Cast 1 is a test cast, and casts 69, 76 and 81 were cancelled due to time constraints. Data were measured at 24 Hz and averaged to 2 dbar. Further details of sampling problems and sensor failures can be found in the cruise report. Bottle samples were drawn for salinity and oxygen from each available bottle depth for every CTD cast. Some bottles were leaking badly and were excluded from any sampling. The bottle depths were chosen from the depths: surface, 25, 50, 75, 100, 150, 200, 300, 400, 600, 800, 1000, (1250), 1500, (1750), 2000, (2250), 2500, (2750), 3000, (3250), 3500, (3750), 4000, (4250), 4500, (4750), 5000, bottom-200, bottom-150, bottom-100, bottom-50, bottom with depths in brackets being dropped (shallowest first) where necessary. On some casts some bottles (especially bottle 20) were double fired, at the expense of another depth, as they were deemed likely to leak. On some casts the bottle depths differed from this scheme due to errors; either deeper depths were dropped in favour of shallower or due to transcription errors. 1) Temperature 1 and temperature 2 calibrated from SBE35 thermometer (see section 3c). Conductivity was calibrated rather than salinity using bottle samples from the CTD rosette compared to CTD conductivity. Overall sensor performance was assessed to be good. Bottle sample salinity and CTD salinity were also compared to demonstrate behaviour of sensors. It was concluded that CTD salinity 1 did not have an offset, although temperature 1 did, and so conductivity 1 was calibrated. Salinity 2 had a slight pressure-dependent offset and was therefore calibrated. 1) Bottle salinity, as measured by the bench salinometer, is converted to 'potential conductivity' at the CTD bottle location using in situ temperature and pressure, and the CSIRO EOS-80 Seawater algorithms. 2) CTD conductivity is calibrated against this 'potential conductivity'. 3) CTD salinity is derived using the corrected conductivity data and the PSS-78 algorithm. Temperature data were calibrated using independent temperature values from SBE35 thermometer compared to CTD temperature. Both primary and secondary sensors were calibrated independently. Oxygen data were calibrated against dissolved oxygen measurements taken from discrete bottles and determined using the Winkler method on board the ship. The CTD oxygen sensor behaviour was observed to have jumped between casts 23 and 26. The sensor was changed after cast 68. See cruise report for further calibration details. This section is part of the One-Time Survey of World Ocean Circulation Experiment (WOCE) designated A23. A hydrographic section from Antarctica to Brazil in the South West Atlantica. A full suite of physical, chemical, biological, meterological and tracer measurements were made. 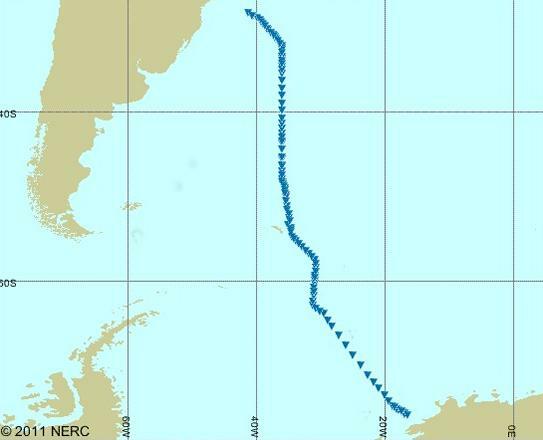 During WOCE in 1995 (James Clark Ross, cruise JR10) the A23 section area encompassed 20-70° S and 20-70° S. Part of this A23 section located in the eastern Scotia Sea has been repeated by theALBATROSS project (James Clark Ross, cruise JR40) in 1999, theUS CLIVAR repeat hydrography/CO2 in 2005 (R/V Ronald H. Brown, cruise A16S_2005a) under theCLIVAR/Carbon repeat hydrography program. From 2010 onwards the British Antarctic Survey has conducted annual cruises to survey the southern portion of this section, from the Weddell Sea to South Georgia. A comprehensive list of cruises is included below the map.